Have you ever tried on 20 pairs of jeans and realise not a single one fits you properly? I have. It’s one of the most depressing things ever! I have proper thunder thighs which means any jeans I can pull up all the way will always be ginormous around my waist. It’s quite the conundrum. Of course the obvious alternative is stretch denim! I’ve had numerous pairs of those over the jeans. The operative word being numerous there. They wear through alarming quickly. So I decided to bite the bullet and jump in and make my own! There are quite a lot of jeans patterns out on the market at the moment. I think lots of patternmakers are realising this is an area where women are struggling to buy RTW and sewing your own is becoming more viable. After much deliberation I opted for the Morgan Jeans from Closet Case. 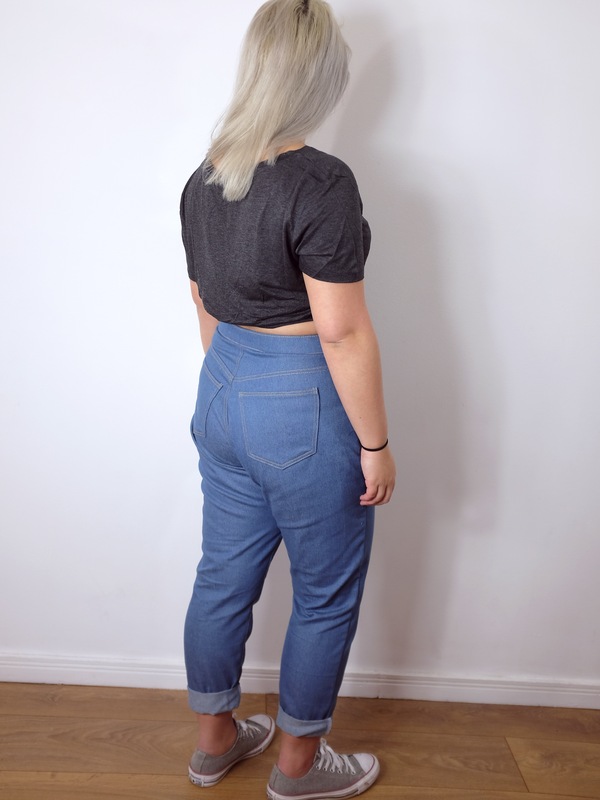 I wanted to make a high waisted but relaxed “girlfriend” style jean. High waists tends to look better on me and I’m so tired of skinny jeans right now. I wasn’t sure if this combo would be the right look for me but I was confident enough to give it a go. I used some denim I got whilst in Hong Kong. It’s a non stretch mid weight denim in a lovely mid blue. I wish I’d gotten a thicker denim but I hadn’t planned on using it for jeans at the time! But let’s face it at $35HKD/yd (£3.50/yd) I’m not complaining. If nothing else this will be wearable toile of sorts! I ended up cutting a size 14 for these – 2 sizes up from my actually waist/ hip measurements. I checked my thigh and calf measurements and that’s where I felt comfortable, knowing I could then take it in at the waist as necessary afterwards. I didn’t want to run the risk of cutting something too small! I have to say the instructions for this pattern are really very good. I tried to follow them as accurately as possible which, considering I’m in the habit of chucking most instructions to the side as soon as I get them, I think I did rather well on. For the most part it’s pretty simple to make. 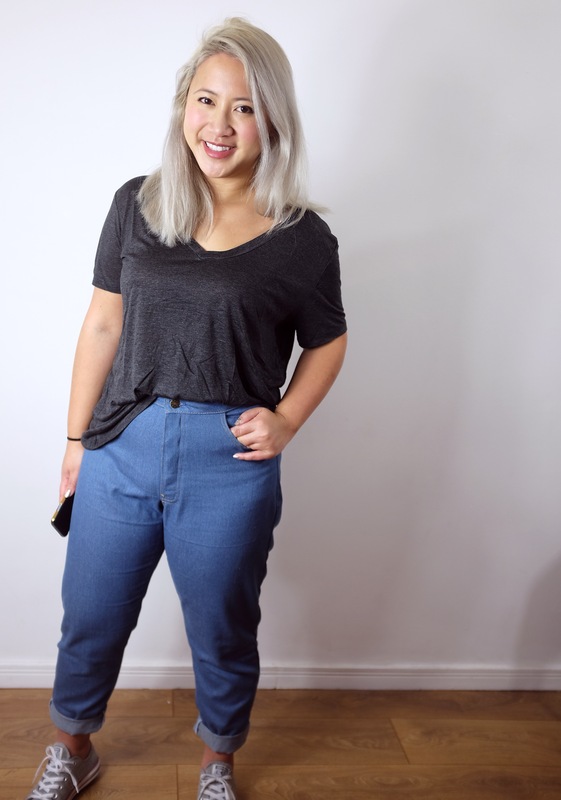 The steps are broken down in bite sized manageable pieces and I’d definitely recommend Closet Case for jeans if you’re in the market for a pattern. My only real difficulty was topstitching. My machine and topstitching thread were not friends in the slightest! I have a feeling the thicker thread wasn’t catching in the tension discs properly and I wasn’t using an appropriate needle either (I was too eager to get started to wait to get new needles!). Anyway, less writing more photos I think! They photograph much better from behind… There’s definitely some small crotch fit problems on the front but otherwise I think they turned out pretty well! The fit is about what I was aiming for – the higher waist and a bit slouched through the leg. I ended up taking out 1 1/2″ from each side seam and the centre back to get it snug. I also took out 1/2″ from the end of each leg, tapering it into the seam. I couldn’t decide whether I wanted a traditional hem or to leave it with a raw edge which is quite on trend at the moment. So I did neither and am wearing them rolled up instead! – Thicker denim. I hadn’t intended this denim for jeans and it’s a bit thinner than I would have chosen otherwise. – Practice topstitching more before starting! I also want to do more decorative stitching over the back pockets next time. – I think increasing the crotch length will help a bit with the fit problem I had there. Maybe. I need to do more research! So, this is definitely a pattern I’ll use again (subject to finding the right denim)! I think it suits my style well and they’re pretty comfy. They’re better than some of the RTW pairs I’ve had over the years anyway! Have you tried making jeans before? I’d love to know how everyone has gotten on with them! Thanks! Yeah, I love this colour too. I always end up buying jeans in a mid blue so I guess I’m just drawn to that colour! I have exactly the same problem! Thunder thighs and a small waist. Last week I bought a pair of jeggings from m&s, took off the waistband, made a huge dart on the centre back seam and reattached a smaller waistband. Not pretty, but at least they fit. But now, I just might have a crack at making some jeans, yours look fab, especially at the back 😊 And I feel quite inspired! Thanks! Definitely try it! It was much easier than I thought it would be to make. Plus I’m much happier with them than I’ve been with any pair I’ve bought recently! This pattern is in my to do pattern this year, so interested to read your comments , they look great! Thanks! It’s a great pattern. You’ll enjoy making them! Awesome jeans! I made the Ginger Jeans last year and they’re almost close to a perfect fit. I just signed up for Heather’s Jeans-Making online class and hope my next pair are 100% a perfect fit! I feel your pain with RTW jeans. It’s so depressing and it’s not like we’re a weird shape for girls! I’ve signed up for the class too! I was floundering a bit with the fitting issues so I thought it might help. I hope it does! I definitely want to make the Ginger jeans too! Yay! Can’t wait to see how your jeans come out post-class! Those really look great! I have some denim…but haven’t even thought about cutting it. This pattern is a definite possibility. Thanks! I’d definitely recommend Closet Case for jeans. The instructions were great. They’ve really found a niche in the market! I had that feeling! I think you’ve just go too bite the bullet and start! Then you’ll realise it’s not really much different to any other pants. Just takes a bit longer with all the topstitching! You’ll definitely be able to do it! I had a go at these last year for MY first jeans making experiment and they turned out much better than I had expected, although I had to put two darts into the waist. A clearly explained pattern. I was thrilled, a very good easy to wear style. Glad you had a similar experience ! You’re right, it’s a good first jean pattern for sure! Couldn’t ask for better instructions! I’m gonna keep working on it to get the fit exactly right but I’m so happy with how they turned out! Your jeans look great – I love the colour of the denim. If your machine still doesn’t like topstitching thread when you try a different needle you can also try using 2 spools of regular thread in place of the topstitching thread. I hear ya with the thunder thighs and rtw fit issues! I have been considering the Morgan Jeans pattern so your post is very timely! I am going to have to read up on trouser alterations though cause I bet I’m going to have a load to do! There’s a great page fitting instructions for the Morgan jeans on the Closet Case site if you need it. I saw it a bit too late but it looks like it would be really helpful. I’m definitely going to use it for next time! These look great on your bum! I’ve been a bit scared of making jeans. Feeling inspired now though! Great work, Emily. I’m another thunder-thighs girl and I’ve just started the Ginger Jeans pattern – I had to let out each leg by 1/2″ to get them on properly! Heather at Closet Case Files published a great fitting guide on her blog for the Morgans – that’s definitely worth reading. I’d guess you need a little more length through the back crotch seam, but that could well be the only alteration you need. Good luck with the next pair! Thanks, I just looked up that page! Kinda wish I’d seen it earlier… Lol. I’m definitely going to have to try out some of those alterations for next time! I can’t decide If I’ve done the wrong thing by making it a few sizes too big and taking it in or if I should have make the correct waist size and let everything else out… I think I’m going to have to experiment a bit! There’s got to be more than one route to perfection – you’ll get great jeans, whichever way you get there, I reckon. Pingback: An embroidered tunic dress - Simplicity 1325 - Self Assembly Required!